If you have never had Hong Kong fried noodles before, well then, good. I only say that because you are going to love this recipe. The Hong Kong fried noodles are essentially a crispy fried noodle that when coated with an awesome stir fry and gravy, they get slightly softened and are perfectly balanced with that soft, crisp noodle. 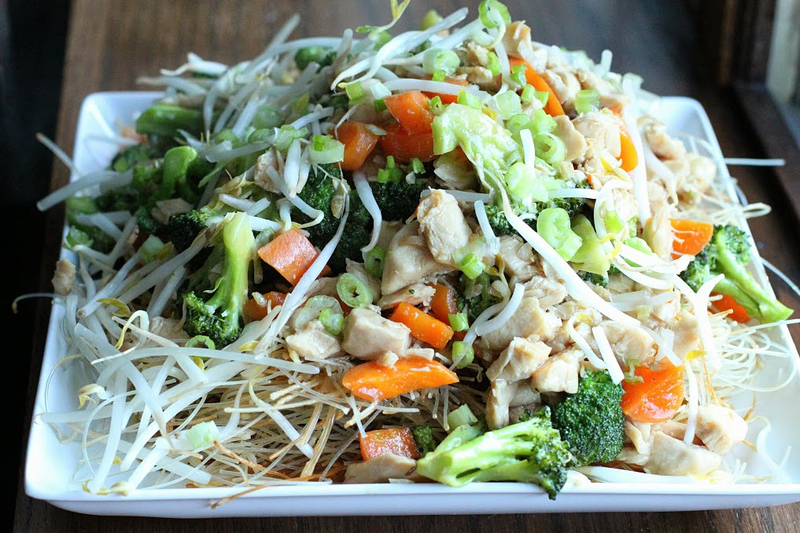 You can make these Hong Kong fried noodles with a variety of vegetables, or meat for that matter, but I think that the chicken and broccoli are a great pairing, and let’s not forget about the sauce, or gravy. The gravy is essential. Start by mixing your marinade ingredients, until smooth, then pour over the chicken in a bowl. Stir to coat. Cover and place in the refrigerator for up to one hour. During this time, prepare the remaining ingredients. Make the gravy by adding the ingredients to a bowl, and whisk to blend all of the ingredients. To a wok, add the canola oil and bring this to a medium heat, about 3 minutes or so. Carefully add in the dry noodles, making sure they fit into the wok. If they do not, remove some noodles and fry in batches. Fry the noodles for about 5 minutes, or until they get a golden brown, on both sides. Once golden on both sides, remove and set aside on a paper lined plate to drain any excess oil. Repeat with any remaining noodles. Drain all but 2 tbsp of remaining oil. Toss in the garlic and ginger and quickly stir. Cook for about 30 seconds, then toss in the chicken. Stir fry the chicken, raising the heat, and adding a bit of water if needed. Once the chicken begins cooking toss in the broccoli and carrots, and give that a good toss or stir. Once the vegetables begin to soften (I personally like mine to have a bit of crunch), add in the gravy. Stir, and let the gravy thicken. I love that part. 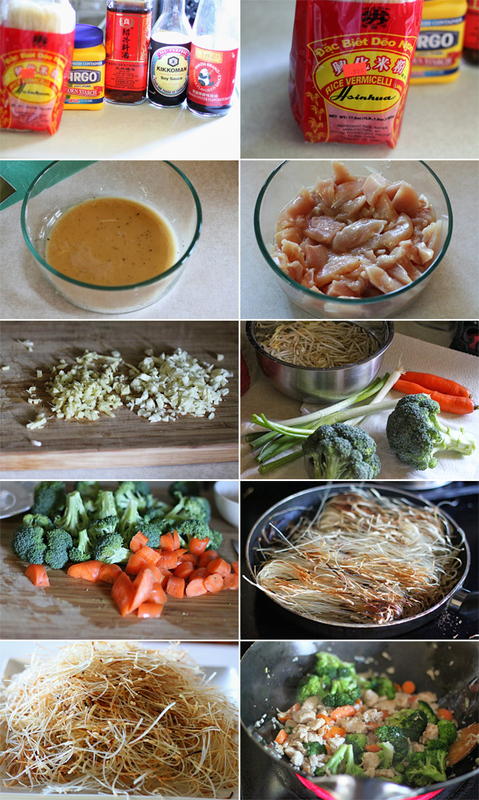 Set your noodles onto a large serving dish, then pour the stir fry and gravy all over the top of the noodles. Top with the bean sprouts and green onion. Let this rest for a few minutes before digging in. 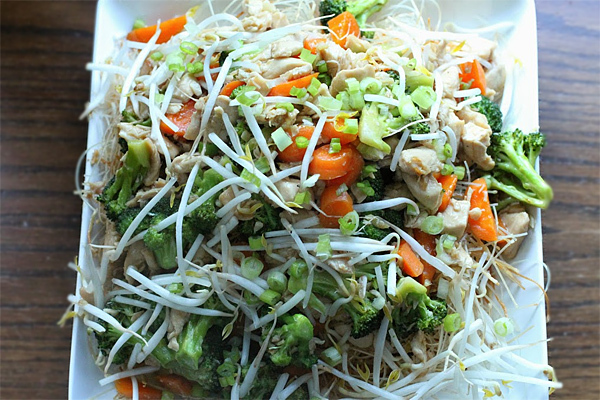 Your goal is to allow those noodles to soften. After a few minutes, dig in. This family style dish was awesome. The noodles found themselves to have a slight crunch, while the majority were perfectly al dente, leading to an awesome stir fry. By the way, if you have never had Shaoxing wine, you will love it. That flavor alone is worth visiting your Asian market and picking some up. I use that quiet a bit when marinating chicken. Hope you enjoy!